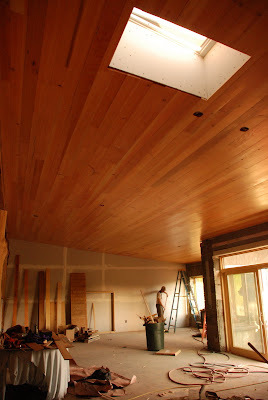 California Homesteading: Main Ceiling Finished! After four solid days of work with the dream team, consisting of Karl and Aaron slinging nail guns, and yours truly running the chopsaw, we completed the entire big room ceiling today. It feels so satisfying. Partly because a project finished is a project finished, but also because it is SO damn beautiful. This wood sings. It is reflective, and warm, and looks phenomenal in that space. Now for plaster in that room, I think the wood will look even better with the plaster right up next to it. We also had team girl today, Jemma and Hope staining additional boards for our next ceiling project. We had Kai on the roof, slow and steady, too. Jemma also finished the last of the compression in our bedroom, meaning we're now ready to tackle the floor project. Ahhh. Progress. I'm ready for bed! Woo hooo! Heck yes, dream team! Way to rock that gorgeous home into existence, lovingly and fiercely. I can not WAIT to see it in the flesh! it looks SO beautiful! I'm really impressed... you'll never want to leave that room! Congratulations Amanda. What a beautiful accomplishment.